This Test is a comprehensive integrated urine drug testing cup! Positive:� A rose-pink band is visible in each control region and NO color band appears in the appropriate test region. It indicates a positive result for the corresponding drug of that specific test zone. Negative:� A rose-pink band is visible in each control region and the appropriate test region. It indicates that the� concentration� of� the� corresponding� drug� of� that� specific� test� zone� is� zero� or� below� the detection limit of the test. If a color band is not visible in the control region or the color band is only visible in the test region, the test result is invalid. Another test should be run to re-evaluate the specimen. 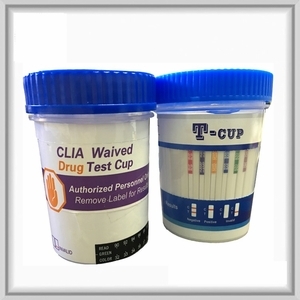 The T-Cup urine drug detection test is ideal for testing employees, students or family members in private, medical offices, government, corporate, pain centers, healthcare facilities, and inmates in law enforcement facilities, probation situations, rehabilitation centers and clinics.